thank you Phil....the gravity of this day is for all of them .....let us hope they are served in a satisfactory manner and give these families a starting point. @Phil... thank you for posting each instruction! I would be surprised if there is a verdict before Friday. There is so much evidence, there was so much testimony and conflicting expert testimony for them to consider. I will forever remember all the names of the victims. Just leave phil alone so he can type!! @NT8: Lol, you're all doing great, thanks for being so engaged! @Tjq... they can't have already decided that's not how it works and they don't know who will be making the decision yet! Do you think the judge will say something after the jury reaches a verdict? Orman was really arguing with Judge yesterday re: that last instruction about jury having to find him not guilty in certain circumstances if agreement can not be reached. Seemed like Judge was very tired or preturbed yesterday. He came down hard on both sides when discussing jury instructions in a.m. Thanks @tjq @LG I just now put in my 2 cents on the poll. Thank you to whoever liked my earlier post!!! 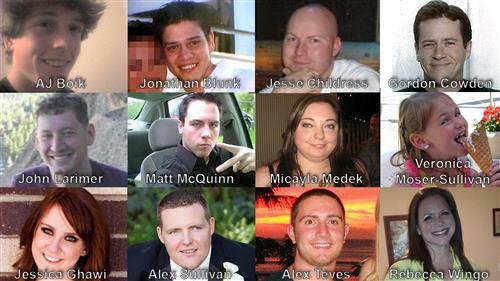 The pictures of these victims should be on the big screen in the court!!! It could take a day to fill out the verdict forms. @LG: awwwwww man!!! I miss it. Oh well. @Tjq In a perfect world they would follow the law, which says they can't have decided yet. I mean, sometimes you see judges blow up on defendants in court after a verdict is reached, but seems Judge Samour has more class than that. Instruction #15: Defendant is charged with attempted murder in 1st degree in 70 counts. Judge reading the names now. Holmes should have to stand a few feet away, facing the jury. Just hearing all the names and number of counts makes an impact of its own! Seeing these photos are hard, but they are a good reminder to remember these 12 innocent people that lost their lives in a gruesome way. I learned that a custodian at my elementary school, a beloved man who is now retired, his daughter was one of the victims. I don't know the name though. Five minutes after the jury gets the case, they should come back out and say: "We all agree this guy is guilty of all counts. Can someone help us fill out the paperwork?" fill one out then copy 12 times. Hearing the names reminds me of Sept 11th. Makes me emotional. @Just Thinkin I feel the same way. Also seeing the photos of the deceased is hard. I think this is going to be a difficult day for all, esp. of course, victims and families. @Phil: WHOA. I love law docs. @mdesignz: That'd be awesome. If deliberations took like, an hour.